"Not much is known about alligators. They don't train well. And they're unwieldy and rowdy to work with in laboratories." We designed our Guthook Skinner with Hollow Grind and partially Serrated edge. It has Mammoth Ivory scales, a curved nickel silver front bolster, and a Kingwood back bolster - all form a striking contrast with our hand-etched Fossil Mammoth Ivory. Made with 440C high carbon/chromium stainless steel for all-around toughness and edge holding ability. This 'best all around skinner' is hollow ground for a very sharp edge, and is partially serrated, as well, to cut through tough hide. 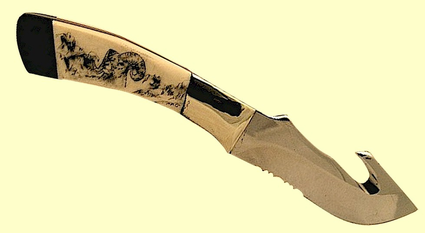 On the particular knife shown, the Fossil Mammoth Ivory is beautifully etched with a portrait of a Bighorn Sheep in classic black and white. Included is a brick red liner. You may purchase this very knife, etched with a bighorn sheep (just click on the picture for a larger image), or have us put your own favorite picture on the scales. Just choose your design from one of our stock pictures shown below, or even a different animal portrait, as an additional option. As an added bonus, let us etched your name, date or initials on the back scale of any knife at no extra charge! 8 1/4 inches overall length with a mirror finished 3 3/4 inch blade. This striking knife is a collector's gem! Comes with soft zippered collector's storage pouch.